A high-profile prosecution of check scammers that targeted law firms, and extensive efforts by bar associations, legal malpractice insurers, etc., to educate lawyers about those scams have reduced the threat, but the AvoidAClaim blog reported receiving over 200 emails last month from lawyers who were the target of scammers. -Client hires lawyer, either by phone or e-mail. -Client sends lawyer a check – a standard check, a cashier’s check, a certified check, or a money order – for purposes of the legal representation (i.e., payment of a loan to a third party, payment for a real estate deal, payment for the purchase of a business, etc.). Alternatively, lawyer re­ceives payment from a third party for the legal mat­ter in the form of a check, i.e., for payment owed to the client for a debt. -The lawyer deposits the check into his or her trust account. Shortly thereafter, client requests that law­yer wire the funds to a particular bank account, minus the lawyer’s fee. In other words, the bank will hold the lawyer responsible for depositing a fraudulent instrument, and will charge it back against his/her account. This will either cause the lawyer’s trust account to be overdrawn, or will cause a shortfall of funds owed to an­other of his or her clients, an ethical rules violation, which the lawyer must correct by replacing the funds. Meanwhile, the “client” is thousands of miles away and tens of thousands of dollars richer. Note that the bank may not discover the fraud for days, weeks, or even months: “Check forg­ers know how to delay confirmation that the check is not legitimate. For example, check forgers may change the nine-digit MICR (magnetic ink character recognition) lines at the bottom of the check. The check may say the name of one particular bank, but the code on the check is drawn from a different institution. 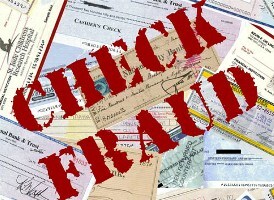 This causes the check to be misrouted, which causes delays in processing the check. There is no banking regulation deadline as to how long a bank may wait to “charge back” your account and recall funds previously deposited. Next post: how you can avoid being the next victim.